The Blackwell Companion to Natural Theology (edited by William Lane Craig and J. P. Moreland) was released on Monday, June 15. Among the contributors are some of my favorite thinkers: William Lane Craig, J. P. Moreland, Tim and Lydia McGrew, (my Baylor colleague) Alexander Pruss, and Victor Reppert. Congratulations on producing what is clearly going to be an influential collection of chapters. 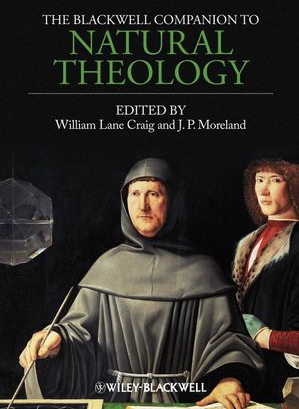 I also would have loved to have seen some Thomistic arguments, but I'm not sure that Craig and Moreland are big advocates of them. At least I'm not aware of Craig ever defending any of the 5 Ways. If he doesn't think they're sound or even defensible, I would be curious to know why. Looks like a good read. Is it coming out in paperback soon? 100+ dollars seems quite expensive. Especially for us students! But in the book he focuses on Leibniz's cosmological argument, Frank, which, while extremely interesting and important, is significantly different from Thomist arguments. Aaron, one of the best discussions of Aquinas's first three Ways in print is in Craig's wonderful book The Cosmological Argument from Plato to Leibniz. It is a historical and scholarly analysis rather than a defense, so from it alone one couldn't be sure what his ultimate evaluation of them is, but my impression is that he regards them as at least defensible. My general suspicion, though, is that since properly explaining and defending the Five Ways and related arguments requires situating them within, and defending, a broad Aristotelian-Thomistic metaphysics, most Christian apologists shy away from them in favor of arguments requiring less in the way of controversial background assumptions. My own view, though, is that (a) A-T metaphysics is true and eminently defensible, (b) Aquinas's arguments, when properly understood in light of A-T metaphysics, are the most powerful theistic arguments there are, and (c) many other related controversies -- about morality, soul and body, etc. -- are also best understood in light of A-T. Hence my approach in TLS of defending the whole A-T metaphysical worldview as a necessary condition of understanding the debate over God's existence, the soul, natural law, and many other issues. Good points, Ed. However, there is a sense in which Moreland's consciousness argument buys into a lot of Thomistic metaphysics. Nevertheless, it would have been nice if the volume had included an analytic Thomist like Chris Tollefsen or ED FESER!!!!! I wonder if, in a book about natural theology, there ought also to be room for the best arguments against it. There is a chapter on the argument from evil. I should think that would count as "unnatural theology" or "natural atheology". "I would really like to read that." "I won't be reading that." I can't help wondering how books would be priced if authors had anything to say about it. Especially academics. I think they would have very different ideas about how much to charge. I certainly would. _But_, we got permission from Blackwell to put "our" version of our paper on the web. It doesn't have their copy editing. Big whoop. Hardly anything was changed in their copy editing. I've had one other contributor to the volume ask me about this too. So if you look at the table of contents on Amazon and see individual papers you would be interested in, check with the contributors (they all have e-mail) to see if they have "their" versions legally available on-line or via e-mail. I was surprised to see that the ontological argument and moral law argument were included. Aquinas rejected the ontological argument and Plato provided a strong reasons to question divine command theory as superfluous to virtue or necessary moral truths. The price of this put's Pascal's Wager in a new light. Put the money down! In William Lane Craig's view, Plato's Euthyphro was directed more against polytheistic divine command theory rather than monotheistic versions. And if David Conway is right--he thinks that for Plato, God and the form of the good are the same--this must be the case. Regardless of whether Craig and Conway are right as a matter of Plato interpretation, though, it seems to me that the Euthyphro dilemma as commonly articulated works against only very naive versions of Divine command theory. You can first of all say that God _is_ the good, like Norman Kretzmann, in which case you avoid the arbitrariness of identifying what God wills with what is necessarily morally obligatory (though doing this seems to have possibly consequentialist implications) or you can identify moral obligations with the commands of an essentially loving God, as Robert Adams does, and once again the arbitrariness of identifying what God wills with what is necessarily obligatory is avoided. The $160 price is after Amazon forced its discount. If you go to the publisher's web site, their price is $200. Could make one hesitate to use it as a book for a course. (An instructor could have her students order the book from Amazon, I suppose. But then you don't find out if there are enough of them until someone tries to get a copy & fails.) Bad for the authors. A main goal I have as an author (I'm not in this book) is for my work to be made very accessible to readers. I put my last versions of my papers up on my web site, but I could do that without the publishers. If the history of the Blackwell philosophy companion series is any guide, then I assume that the hardback is intended primarily for the reference sections of academic libraries -- rather than for the textbook market -- and that a much cheaper paperback will follow at some point. There doesn't seem (to me, anyway) to be a clear pattern, though, to Blackwell's policy here, insofar as some volumes in the series seem available in hardback only for far longer than others do. I remember some years back the local Borders was selling the hardback of Jacquette's A Companion to Philosophical Logic for the paperback price. Now that, I need not tell you, is a markdown. My conscience moved me to tell the clerk, but he checked the computer, shrugged, and said "Well, that's the price." Still, I knew there had to be a glitch somewhere, whether this guy cared or not, and I couldn't bring myself to buy it. You are _way_ more conscientious than I am, Ed. I would've bought it. Well, I'm not saying it would have been wrong to do so. At the end of the day a dealer is the one who decides what he is going to charge, and though the clerk in this case is merely an employee of the dealer -- which is a big chain whose prices are set centrally -- he can reasonably be seen to have delegated authority to decide what to do in a case like that. Bobcat - thanks for your comment. People carry on as if the "Euthyphro problem" were dispositive. And it's just not. I think there's a lot of life left in Divine command theory. What's especially odd is that legal positivism (if a state says that x is the law, well that's all there is to it) is considered reputable, but divine command theory (if _God_ says x is obligatory, well that's all there is to it) is out of bounds. Brad: that's not *obviously* responsive - but I've been known to miss important points, when phrased obscurely. Bobcat, that's an interesting point, but don't most legal positivists more or less expressly eschew the idea that the law makes something _right_? The idea, as I understand it, is supposed to be, "Right, shmight. Don't talk to me about right; I'm talking about the law." So the objection to divine command theory is to the claim to make something _right_ by divine command, not to make it the law. I suppose another way of putting it would be that if we are all obligated like robots to obey the law even if it is immoral, then all the moral opprobrium for immoral orders can be shifted back onto the shoulders of the law-makers, but it doesn't actually disappear, as though the law could actually make the thing right. I think there's a lot of life left in Divine command theory. Many businesses are closed on Sunday, which counts for something. I don't view that command as a necessary moral truth, although it may be pragmatic as a way of refreshing the mind and body. Legal positivism, as I understand it (which is not very well!) is the view that whether something counts as a law has nothing to do with morality--so, the laws of Nazi Germany are just as much laws as the laws of 21st-century Canada. Obviously, one could combine that view with a full-throated realism about morality. One could say, well, law X is immoral, but for all that, it's still a law. So my earlier comparison is not apt. That said, I think there are a lot of happy subjectivists in moral theory; it's worth cataloging what they say and seeing the similarities to DCT. So, cultural relativists say x is morally obligatory for members of culture C because it's the norm of the vast majority of culture C. If you take this view, you can't exactly look askance at the DCTer who says that x is morally obligatory for anyone under God's dominion (i.e., everyone) because x is commanded by God. Ditto, of course, for individual relativists. So, anyone who is a cultural or individual relativist but who makes fun of DCT for making morality arbitrary is being, I think, inconsistent. I also think it's worth thinking about more philosophically popular positions, like desire-based theories, or Railtonian moral realism. For the Railtonian moral realist, if I understand it correctly, x is really, truly obligatory for you if a perfectly informed version of you would advise you that you have to do x. One can always ask, "why should I care what this perfectly informed version of me thinks?" just as one can ask "why should I care what God commands?". But one answer suggests itself for a Railtonian: "you should care what a perfectly informed version of you thinks because (a) you care about satisfying your own interests; and (b) that version of you has your best interests at heart because he is you and he cares about satisfying his interests" or something like that. It shouldn't be hard at all for a theist to employ a similar response. Nevertheless, Railtonian moral realism is more respectable than DCT. Hi Steve, my point and I think it is consistent with the scripture reference is that natural man will not have reasonable compulsion to even recognize God's authority, even if they have given that ultimate respect to civil law. Bobcat seems to be saying that it is odd the people will accept the thought that law can be ultimate, but God's law cannot even be considered, but I'm suggesting that this is what is to be expected of unregenerated people--those it seems are most prominent in modern culture. This point may be obsure, but it is in the spirit of Lex Rex which is primarily grounded in the knowledge of God's authority ala John Knox. Men who are dead in their trespasses and sins, still walk in darkness, according to the course of the world and the prince of the power of the air, and according to the spirit who works in the sons of disobedience. They dont just deny God's authority, they cannot legitimately consider it, being under the control of Satan's logic. It[my point] also may be less obscure in Reformed circles of believers. Hi, I just came across this book in its entirety online. I downloaded it to my desktop for free. Thanks, Jeremiah! I had despaired of obtaining that book.